The never-ending search engine Google never fails to amaze the world with its miracles. It has launched a new search engine for the Data Geeks, Data Scientists, Data journalists who would be in search of the data and predict the business. Natasha Roy, the Research Scientists at Google AI published in the official blog regarding the latest update. It is also said that The Google Dataset search would be similar to Google Scholar and helps people to find datasets from miscellaneous sources. They have also developed certain guidelines to be followed by the Dataset providers. You can find the guideline here. Through these guidelines, they can provide better quality content which can make the search engines understand. Every minimal detail about the content as in where and when it is published, who developed it, how the data is collected and what are the terms and conditions for using that particular data. 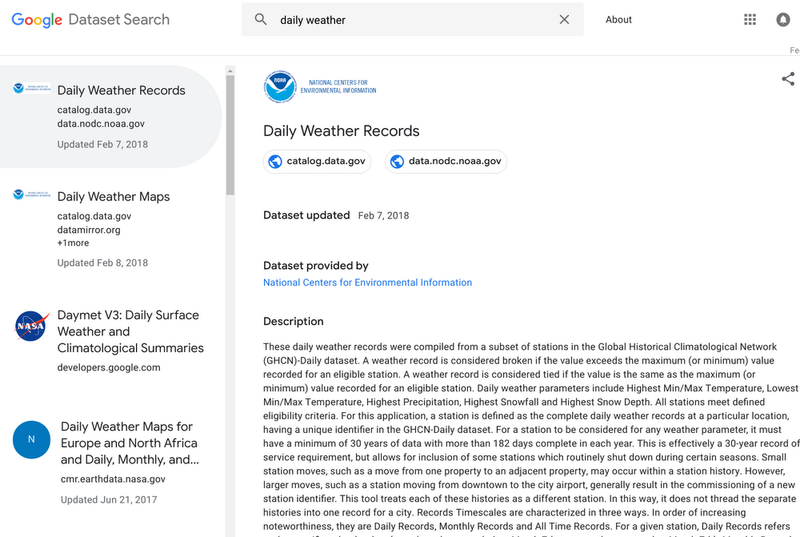 Google then collects the data and links information, analyses the different versions and find the accurate publications that describe or discuss the datasets. Google then collects and links this information, analyses where several reports of the same dataset might be, and finds publications that support in naming or addressing the dataset. “Our approach is based on an open standard for describing this information (schema.org) and anybody who publishes data can describe their dataset this way. We encourage dataset providers, large and small, to adopt this common standard so that all datasets are part of this robust ecosystem,” said the Google. It is said that Dataset Search supports multiple languages and in the plan of introducing a few other languages.